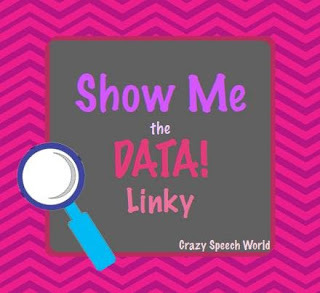 Today I’m joining up with Jenn over at Crazy Speech World for a Data Linky Party! I wanted to show you the data sheet I’ve been using for a few years. It works for me. I do all the prep work at the beginning of the year and print off about 10 copies to get the year started. I staple the data sheets and put them in the working folders I use for each group. I write the quarter in the top right hand quarter. After I write a progress report at the end of the quarter, I file the stapled sheets in the students file. At the end of the school year I staple the 4 different packets together. The document has student IEP objectives across the top. I love that it allows me to look across the column and decide which goals I need to hit more frequently. 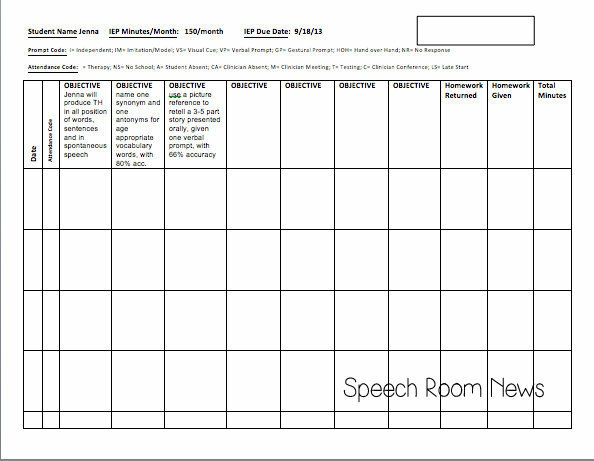 I use the big box on the top right to make notes about goals I want to include for the next IEP. So when it’s time to write a new IEP I just look back at my notes in that box. At the very bottom of the sheet I total the data in each column. When I write a new IEP, I copy/paste the new goals into a new data sheet. You can download the template for free in my TpT store here. Make sure you head over to Jenn’s Linky Party and see what everyone else is using to collect data! Thanks for sharing! I really like how you have a column to list homework shared and homework returned. So smart. Thanks very much for sharing Jenna! I’m wondering how often you record data for each goal? I love the big box in the right corner, because it totally beats staring at the computer screen blankly when IEP time rolls around! OH me too! I am good about making those notes and it’s good when they match every few weeks! If I wrote PRONOUNS on every page, hey, write the goal already! Thank you so much for sharing your data sheet! I am beginning my CF and I was convinced I was going to do paperless data collection. This has been a bit overwhelming. This is already helping with my efficiency, and I just downloaded it this week! Glad I could help! Paperless (google docs or on ipad) always sounds like a great idea, but sometimes it just isn’t manageable when you have the actual kids in front of you! Goodluck! these are excellent along with the attendance sheet and goals’ sheet for each student. thank you Jenna! Have you ever tried IEPpal.com? I have been using this app to take data for the past two months. I have really messy hand-writing so for me, going paperless seems okay…..so far…..